Three expert rules for keeping your metabolism revved all day long. "MyÂ metabolismÂ is so slow!" "She can eat whatever she wants without gaining a poundâshe must have a fastÂ metabolism." We throw the M word around all the time when discussing food and weight loss, but there's so much more to it than how quickly you can burn off a cheeseburger. YourÂ metabolismÂ is the process that converts what you put in your mouth into the energy that powers every little (or big) thing you do. And, yes, your basalÂ metabolicÂ rate (BMR)âthe number of calories your body needs to melt just to stay aliveâis partly genetic, which explains why some women can eat junk and stay rail thin, while others seem to just look at a pumpkin pie and gain 5 pounds. 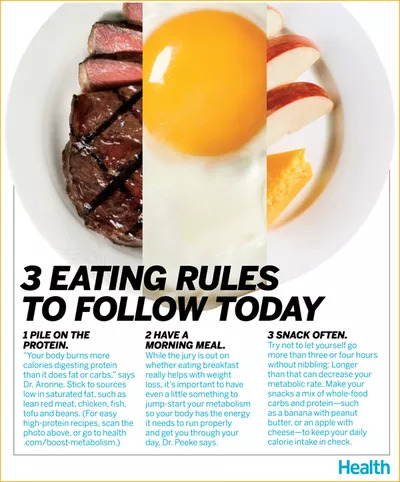 YourÂ metabolismÂ is also influenced by plenty of other factors, however, such as your age and even your lifestyle habits like sleeping routine and snacking patterns, says Pamela Peeke, MD, author of The Hunger Fix ($12, amazon.com). Here are three expert rules for keeping your metabolism revved all day long.